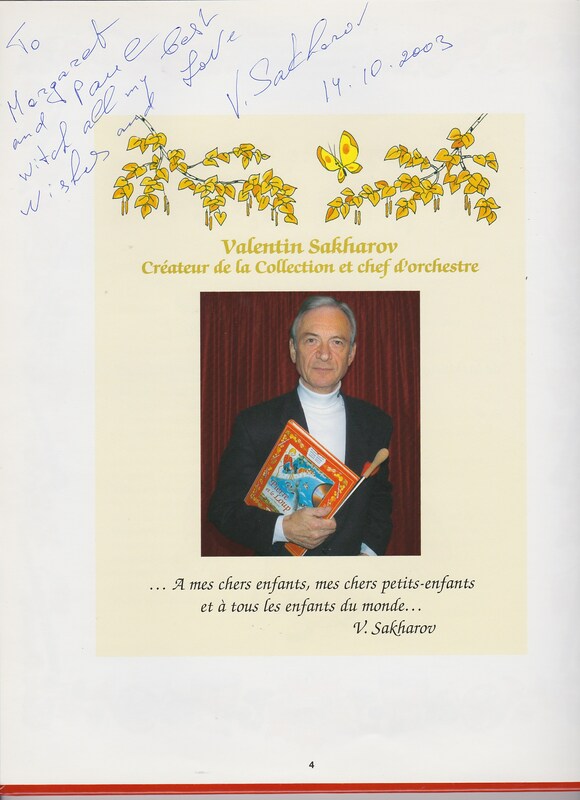 My old friend, clarinetist VALENTINE SAKHAROV, and pages from his production of Peter and the Wolf. 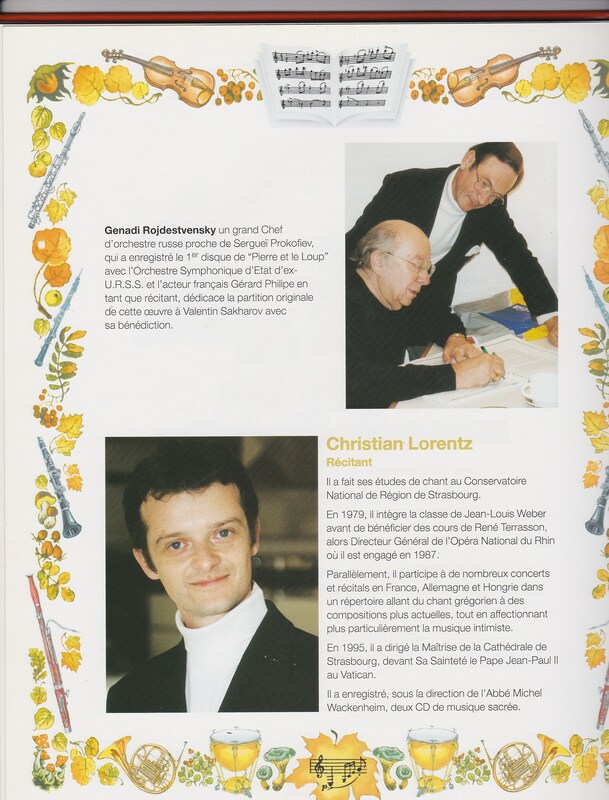 I am talking about my old friend and colleague, VALENTINE SAKHAROV, clarinettist. I met him in November 1973 when I started work with the Elizabethan Sydney Orchestra, now the Australia Ballet and Opera Orchestra. I'd heard about him already. A defector from Communist Russia, he nevertheless carried the flag of Russian clarinet style in opposition to the perceived empiricism of the perceived English clarinet style. I say “perceived” because, in truth, there were a great many factors involved and Valentine would not have been aware of the fine middle European clarinet stylists who had preceded him to these shores. He was aware, however, that the “top job” in Australia was held by a man playing the Boosey and Hawkes instrument in an identifiably “English” style. Donald Westlake, principal clarinet of the Sydney Symphony Orchestra, was a highly influential player and teacher and Valentine was quick to offer an alternative. He played Buffet instruments with a Pomarico mouthpiece and had a killer technique. Before long a turf war of sorts erupted. “Don says you play as loud as a trombone,” he was told. How did he come to be in Sydney, you ask. At the height of the Cold War, he defected. Playing for the Bolshoi Ballet, he organised his pupil to act as deputy for Romeo and Juliet while he traveled to the airport with his French wife, Christine. As they boarded the plane they heard his name called, and Christine, who had diplomatic immunity working for the French Consulate, pushed him on. He worked in France for a time but decided to travel to Australia, where his mother lived in Melbourne. Christine got an embassy job in Melbourne and the future looked set. Valentine was handsome in a hard yet boyish way and looked quite different from his mother who was full of figure and dark-haired, in a typically Russian-Jewish style. The father he never met was a Russian war hero who died, leaving mother and son a close unit. Mother worked in a Hospital/College as a nurse, and their abode for years was a curtained-off space in the College. As far as the State was concerned, he was a true Russian, with a father to be proud of. For the Jewish community he was Jewish because of his maternity. Needless to say, in war-time and post-war Russia, his paternity was more advantageous. Anyone at all familiar with the history of Russia at that time will realise that there were precious few advantages of any sort to be gleaned anywhere – however, Valentine managed to gain entry to a military musical academy in his teens. 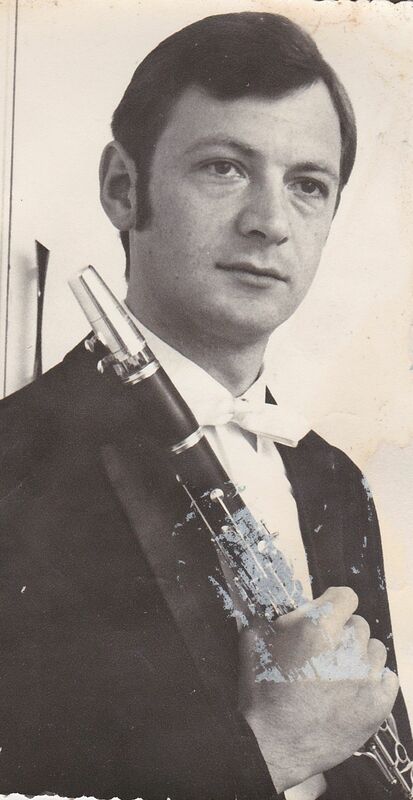 Val's formidable technique was honed in this demanding school and further refined at the Conservatorium before he passed into professional life as principal clarinet with the Bolshoi. Some of this “militarism” passed into both his personal and private lives. He had an impressive arsenal of audition excerpts which were paraded at short notice upon meeting other clarinetists. This generally devolved into an amused or exasperated colleague enduring the display with varying degrees of good humour. The fine English clarinettist, Anthony Pay, played Val at his own game and chimed in with all the famous excerpts of Mozart, Beethoven, Brahms, Tchaikovsky, Rimsky Korsakov and more in a version of Duelin' Clarinets. Unable to burn off the persistent Pay, Val resorted to an excerpt from The Fountain of Bakhchisarai by Asafyiev. “Do you know,” Val said to me later, “this boy – he very good, but he not know this,” and shook his head in wonderment at the ignorance of the West. Valentine's posture and finger technique were also impressive, and in some of my first professional engagements I found it thrilling to not only hear, but to look down the line of the clarinet section playing Puccini, Strauss and Stravinsky and watch the choreography of well-shaped hands in a clarinet section which included Claude Rousseau (Conservatoire-trained) Walter Mack and I think a young Pam Johnston. Val's finger choreography was also a highlight of many ballet programs. As the Pas de deux unfolded on stage Valentine would do a “finger puppet” version of his own for the amusement of his colleagues. These, happily, were often in questionable taste. Needless to say, Val offered plenty of leadership in the orchestra and could always be heard. He rarely questioned his own judgement and tested various relationships. In one opera, he refused to resolve to the final note at the end of a solo when directed to do so by the conductor. “Conductor is only colleague,” he would say, “not superior, only one more worker among equals.” It took some convincing to get the message across that the placement of the final note was to coincide with the lead tenor's placement of a “fatal cup” upon the table, and the the final note carried the appropriate message of doom – at that precise moment. To his credit, he got the message – he was not the only one of course. A fine trombone colleague also refused to indulge in a comedic gliss – a coarse trombonism of an old school, he thought. That is until he saw a production of Don Quixote, where a cartoonish episode occurs of a spear in the rear. 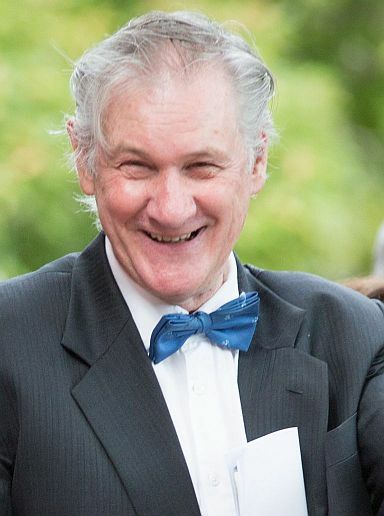 During this time Val lived at Turramurra with his wife and four charming children. He could be harsh with them. “I give them military discipline,” he would say, but it was just a pose. The family also had several chooks (the chief hen was Mrs. Murphy), budgies and a little dog called Uncle Vanya. One night Val said to me. “I have come home from rehearsal and find budgie in trapeze. He is dead.” Here he mimed a budgie strangled in its own trapeze, slowly rotating this way, then that. Val took the family to Lake Eucumbene for a hunting trip. Most of our European arrivals loved the great outdoors here - “Like Vild Vest” they said. Val was no exception, and off they went. “How did you go?” we asked upon his return. It transpired that on the way home there was a traffic jam. Val got out to find someone had driven into a cow which lay dying on the road in great distress. Ever the man of action, Val got the rifle out again and despatched the suffering creature. But for Man the Hunter, there was more. A shame, thought Val, to waste all that steak. “Oh no,” you say. “Oh yes,” I say. Out came the hunting knife, and Valentine excised the Sakharov family's evening meal. Even we city folk knew that the flesh of a dairy cow slaughtered in extremis and unhung would be, to put it mildly, unpalatable. Valentine always spoke very deliberately, with a Russian accent overlain with a strong French one. He admired the French, and was proud of his Citroen car with the floating suspension. “Welcome aboard,” he would say. He kept up his practice routine, but Uncle Vanya (no, the dog, remember) would “sing” along, so had to be shut in the toilet with a transistor radio on a pop station to keep him quiet. One day, Val got the dog out, and rang his friend Eugene Daniloff, in Melbourne. He placed the phone down and commenced to play the Latvian Polka, accompanied by Uncle Vanya's enthusiastic howling. At the conclusion of the piece Val picked up the phone. Val contracted stomach cancer, and was treated by the father of Beryl Potter, that fine pianist who had accompanied Val on many a session. The operation was successful, but did take a toll. Sharing with Val on a tour I noticed him in a long discussion with a lady musician. I was first back to the room, and when he eventually arrived, he got out the supper things, usually poppy-seed roll and Pernod. Valentine was conscious of appearances, and often concluded a particularly effective solo with a theatrical flourish of the right hand. This is not uncommon to clarinetists in general and is done in slow motion for best effect. It is akin to a golfer holding his pose in follow-through when he knows he has hit a particularly good shot. Martin Foster, formerly Contra-bassoonist with the Sydney Symphony Orchestra had noted this, and after a particularly lugubrious entry would grandstand in similar fashion to the amusement of all. Martin's name, by the way, was often spoonerised to “Fartin' Monster”. What he was saying was really what many Europeans have found – that Australia, with its English-based institutions and ways, could be confusing and irritating. And like many Europeans, he could see things which could be improved, but had no leverage with which to effect such change. France loomed larger and larger in his vision and '76s he left to take up a job in Strasbourg, France, with the fine orchestra there. He made many trips back to Australia, to visit his mother, and often subsidised his travel by bringing out a brace of Buffet clarinets. “Ah, you will be lucky dog,” he would say to the prospective buyer. He divorced from Christine, and remarried – Tania, a Russian-born violinist in the Strasbourg orchestra, with whom he had two more children. Although Valentine extolled the virtues of France and was well-treated, his career had peaked, and he was gradually disenchanted. The marriage did not survive and Val was becoming more difficult. His dream was now to secure a teaching position at the Sydney Conservatorium where he could be the eminence gris which he had always aspired to. 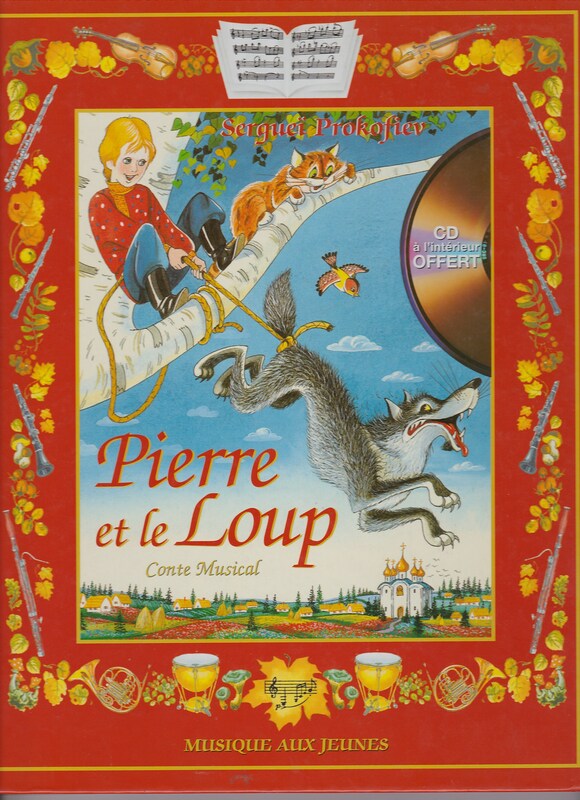 In the meantime, he had re-written Peter and the Wolf to free it from the Stalinist influences which he claimed had distorted it. Accordingly, he had the book re-printed in Czechoslovakia in the traditional Russian style featuring prekrasna – the Russian “special red” and traditional motifs. He traveled back to Moscow to record an accompanying disc, but this was not an artistic success, and one had the feeling he was being used by the Russian musicians. All this cost much money and he became increasingly desperate to make his mark. It was in the late 70s that he saw his old friend,Valery Popov, bassoonist touring with the Moscow State Orchestra. “Valery, who is KGB?” he asked. Valentine was aghast. “You!!! How can you, how could you?” Ever since he arrived in Australia, Val had worried about Soviet surveillance and retribution, for those were the days of the poison-tipped umbrellas wielded by Bulgarian agents. But Valentine hadn't. He married a third time and drank heavily, still hoping for the Sydney job, an extended Australian tour of the new Peter and the Wolf, or a fourth wife to be everything the others hadn't. He died in 2004. You can see that, like the rest of us, he was imperfect. The German hospital where David received kind treatment. 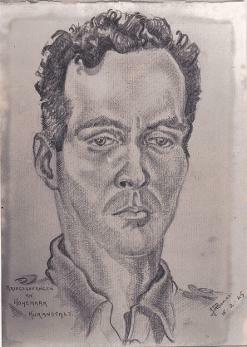 It's February 15th, 70 years to the day that Margaret's father was sketched by a fellow prisoner of war in Germany. David Dickson's plane was shot down returning from a bombing raid on a synthetic oil plant at Leuna, near Hamburg. I have just tracked down the hospital he was in and this is it, Klinik Hohemark, just north of Frankfurt. It was David's 22nd mission and he'd never parachuted before. He had to be cut down from a tree. David seemed to believe he was in Weimar (perhaps that was where the plane crashed) and he took comfort in the thought that Bach had been there. He was well treated and always admonished people to be kind to the German people who had been kind to him. However, David was chastised in later years when he said this, and he realised just how fortunate he was, and how rare his experience. Nevertheless, it was true that he received exceptionally kind treatment at this place, and the Allied powers agreed, for they permitted the hospital to continue functioning after the war, in recognition of its generous treatment to Allied airmen. His leg was full of shrapnel, and he was asked, in English, "Does your leg hurt?" Ever the polite Englishman, he thought he should reply in German, and, considering that Eine Kleine Nachmusik is usually rendered in English "A Little Night Music", he replied "Eine kleine." His leg hurt a lot, and bothered him greatly till his death in 1993. At one stage in the hospital he was told it would have to come off, lest gangrene take over. Knowing that the Americans were coming, he begged them to wait a little longer. They did, and the new drugs saw him through. The inset photo is David 10 years earlier, and I am grateful to Karsten Ratzke for the picture of Klinik Hohemark, that island of civilisation at a dark time. It's an annual event I love playing at. As the sun sets over the northern Victorian town of Beechworth, memories of the gold and the bushrangers are subsumed by the timeless sounds of orchestral tuning, the piping and warbling of both singers and magpies and the picnic clinking of fine Victorian wines. My own modest preparations were interrupted by two representatives of the Border Mail, the Albury newspaper – “We'd like your photo,” they said, to my surprise. Well, I considered I hadn't reached the status yet of “interesting old character” but that's all a matter of perspective. That did it. Local content! We lined up for the shot you see now. My own relatives posted it to me, and I was not displeased. Even the blurb I had artfully imparted to the journos as idle chat had been faithfuly reproduced. Then I received another copy from a friend, and it looked just the same. Months passed, and Claire and I worked together again. “Would you like me to bring in a copy of the photo?” she asked. “That would be wonderful” I gallantly replied. When it arrived, I saw immediately that something was different. My copies had no headline, but hers did. My friends and relatives had folded it over to conceal it. “What did it say?” I hear you ask. Music is often analysed through its components, usually given as pitch, rhythm and timbre. Pitch is perceived as high or lower sounds, rhythm is the regularity of attack and timbre the quality of sound. Before you say anything, yes, it is much more complex than that. After all, try telling Rembrandt that his art consists of three primary colours. Harmony? It is the combination of different pitches, and much early music was involved in discovering the relationship, fixed and physical, between pitches. Harmony has a magic all its own, and even if we take it for granted, few of us fail to thrill to that magic even if it is a mystery to us. At Margaret's first violin lesson, she was pleased to produce a pleasant sound. Then her teacher played another note, and another, harmonising with Margaret's sound. The effect was powerful, and Margaret broke into tears. To this day, whether playing a string quartet or a Mahler symphony, music is a highly emotional experience for Margaret. Teaching my woodwind instruments, I use the same ploy. Having got Peter/Peta to sustain a good quality note, I colour it with my notes. It is wonderful to see the bug of harmony bite immediately and I know another has been launched on that great human adventure called Music. It was one of those low-light, black marble washroom complexes – even a nice acoustic as I walked briskly out. Turning right I became immediately aware I was about to collide with a tall, well-dressed man. It was all over in a flash – a loud bang and I staggered back as bystanders looked round in surprise at the woozy man in front of the full wall mirror. Thank you for asking, but no, it was mostly my dignity which was damaged. When Adelaide came home one Saturday she looked different. I had forgotten, as Adelaide didn't do much modelling. Tall for ballet, short for a model, she had been an inch below minimum height for the Moulin Rouge, but compensated with strong dancing. But she had been asked by a friend to do this one, so, with mild misgivings, embarked on the project. “And how was it?” we asked. It is true that being her mother's daughter, Adelaide is blessed with a fine figure, but a shapely bosom is considered “surplus to requirements” in some endeavours. “And the show?” was our next question. “That's great then,” I said, and took her photo. Months later, we saw our old friend, Ivana. “We saw Adelaide,” she cried. Of course, my God-daughter Victoria was soon to marry and they'd been at the Fair. So, here's a toast – “TO THE MODELS WHO EAT LUNCH”. OF MICE AND MEN, OF CABBAGES AND KINGS, OF ARTS CENTRES AND WOMEN'S TOILETS. ...and after the Opera House concerts with the APO, it was back to the refurbished Hamer Hall. Just as I played the first public performance in the Opera House (War and Peace) I played in the first Hamer Hall concert. It was then called the Melbourne Concert Hall. Of course, this means that I have, respectively, 42 years and 33 years experience of playing in these venues. Each time I visit these wonderful venues I find that the latest refurbishment has brought the walls closer, has lowered the ceiling and has dimmed the lights. Musicians jostle for places to unpack their instruments and find that cords and cables clutter former quiet zones. It is the Hamer Hall refurbishment, in particular, which has sharpened my pen today. Since the opening in '82, the band room has shrunk appreciably. The double door exit on stage left has become a one-person defile, part of the room having been appropriated for a neighbouring facility. The instrument storage room, a valuable and thoughtful feature, has also been walled off in favour of another department. The blue décor, not always appreciated by everybody, but soft and restful. has been replaced by a utiliarian dark grey carpet and matching paint. This is supposed to be relieved by a 50s lime-green kitchen area – it isn't. Many of the younger musicians do not realise that it was ever any different. The wall was previously lined with a generous carpeted shelf, with a lower ledge also, just 10 centimetres from the floor. Many a performer has napped here. There is now no lower ledge and the upper one is half size and can fit a violin case sideways only. The performers Green Room, where one could purchase a reasonable meal and meet fellow artists, has long gone (The Opera House Green Room is a meeting place for performers from all disciplines). I am sure there are many more aspects which might be mentioned by those who frequent these premises more regularly than I, in particular, MSO members. Even the mens' toilets have not escaped these cuts, and where I once enjoyed the democratic company, shoulder to shoulder, of 3 or 4 colleagues “shedding a tear for Ireland”, I now have a choice of 1 urinal, 1 booth, 1 wash basin. Formerly it was 2 or 3 booths, urinal for 4, and a wall of wash basins and mirror wall. The howls of outrage from the women's block ring in my ears still, and it is this in particular which has forced my hand. The size of orchestras since 1982 has not diminished, and the proportion of female performers has increased. I am given to understand that the “shelf space” - that ledge where ladies pop their handbags while they straighten their attire, adjust make-up and perfect their coiffure – has shrunk to half size. The mirror wall has disappeared, being replaced by dinky little mirror strips immediately in front of the individual basin...it is a thoughtless piece of design at best. Did a woman design this? If so, was she a performer? Who was consulted? To labour a point, I have been coming here for a long time. I have seen managers and governments come and go. Also generations of lighting experts, acoustic engineers, architects, security advisors and techs of every kind. Here I am reminded of Jim Hacker's hospital episode http://www.yes-minister.com/ymseas2a.htm where the the award-winning St. Edmund's Hospital has 500 staff and administration, but no patients. After all, people come here to see and hear performers on stage – it is disheartening to see that our administrators either do not learn or do not care. While I am on the subject, I expect to soon perform at the Vic Market with Opera in the Alps. 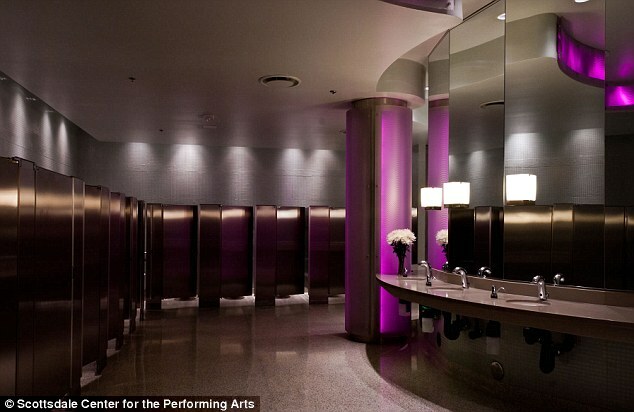 I know that, in the interval, the womens's toilet block will teem with disgruntled patrons waiting their turn. I know it's an old venue, but it is a perennial disgrace that women have to queue so long for inadequate facilities in so many places. Just as I, confused by so many issues, have decided to vote for whomsoever can stop nuisance phone callers from another continent, I would suggest that the issue of “women's facilities” might be a practical factor for many in voting considerations. 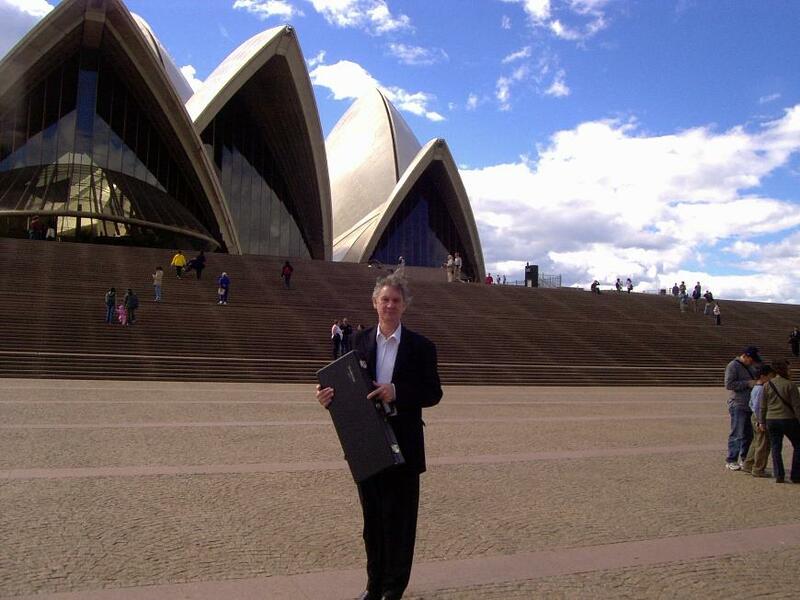 I have now been playing concerts at the Sydney Opera House for forty-one years. It hasn't changed much. Nor, I insist, have I.
September 28, 1973, was the first public performance, Prokofiev's War and Peace. It could well have been descriptive of the relationship between Utzon, the Danish architect, and the NSW Government who paid for it. The woodwind players were able to empathise with the travails of the on-stage soldiers, as we sat during rehearsals with our backs to a perilous drop to the stage machinery, protected only by a rope and a wooden strip nailed to the floot to prevent our chairs sliding back. A back wall was installed, but the air was stifling, as the orchestral pit was one of the exhaust vents for the air conditioning. As a consequence, we got the last gasp of exhausted air, and were falling asleep at the controls. I spent much time with my face to a unsealed join in that wall, reviving myself with cooler, fresher air from the backstage space. Eventually, a specialised system was installed in the pit. The pit was small, with room for only two double basses. You could fit more, but only if they didn't play. The heavy pit doors opened inwards, which was a big problem in case of fire. When this was pointed out, we were told that, as it was considered that the main danger of fire was from the backstage machinery, the pit was actually the escape route for the technicians who would then join us in climbing up into the audience. These “teething problems” were gradually rectified but I moved toMelbourne to play with the Victorian equivalent orchestra, now known as the State Orchestra of Victoria. Having rehearsed Romeo and Juliet ballet 19 times, and performed in it in Sydney and Brisbane, I now rehearsed it 19 times and performed in it many more, round Australia. I went back to the Opera House with the Melbourne orchestra, which generally travelled to Sydney for the December ballet season. Staying at Manly beach and travelling by ferry for the evening performance was a pleasant task indeed. It was an election night, 1975, performance with the ballet that was memorable. The Whitlam government had been swept from office that day (Whitlam and his wife were wonderful supporters of the Arts and their presence at these events had always been uplifting) and the audience at the ballet were dismayed to hear someone call out “Turn on the lights”. This phrase had been the Liberal Party slogan for the campaign. People were therefore annoyed that they should intrude their political preference into the performance so rudely. They expressed their indignation vigorously. As the uproar subsided, it was realised that this phrase was the unfortunate choice of a man trying to gain assistance for a friend who had just experiences a (fatal) heart attack. Eventually, the lights were turned on, then muted, as the unfortunate man was carried out, accompanied by his distraught wife. The ballet re-started twenty minutes later. 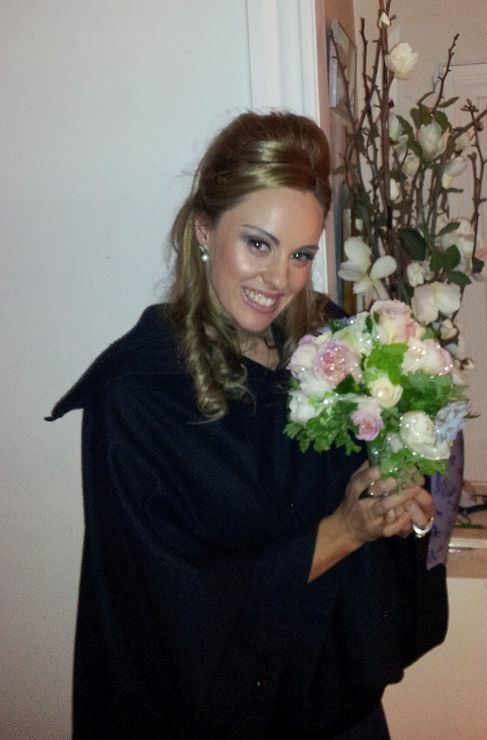 It was “The Merry Widow”. Subsequently with the Melbourne Symphony Orchestra for 23 years, I played occasional visiting concerts till the new century. At this stage I joined the Australian Philharmonic for its many themed shows in the Opera House – light orchestral done with polish and poise. The photo is from one of these visits. It is one such show that I have just done and I particularly admired Kate Ceberano's other-worldly way with a song. But times change, andthe relentless crowds that throng the forecourt are shepherded by a smaller crowd of unsmiling security men, doing their job...such a long way from the early days when we, the musicians, drove our cars in, parked along the seawall and skipped blithely up the stairs. Naturally, I am looking forward to playing there for the next 41 years, even if the Harbour waters are lapping the stage door by then. There will be 2 more of the current show in the Melbourne Concert Hall tomorrow – New Year's Eve. After many seances with 14th century Maxwell of Norwich we were so comfortable with him that we got into the habit of asking him for jokes. We were used to his witticisms, and asked him to extend his repertoire, which he obligingly did. We became critical of his jokes, for they seemed occasionally trite and commonplace. We were surprised when he seemed offended. 'WELL, YOU ASKED ME TO TELL YOU A JOKE AND I HAVE MERELY TRIED TO OBLIGE". Then, after a short silence-"WOULD YOU LIKE TO HEAR THE SORT OF STORY WE TOLD IN MY TIME?" "Yes, we would" And here we listened to a long and strange story, told in a very deliberate and artistic style. Any time I tried to anticipate a word, I was told "WHO'S TELLING THIS STORY, ME OR YOU?". Even this obvious expression he spelt out in full, allowing absolutely no interruption. Here is the story. "ONCE UPON A TIME, LONG BEFORE THE TIME IN WHICH WE LIVE, THERE WERE TWO CIVILISATIONS UPON THE EARTH. 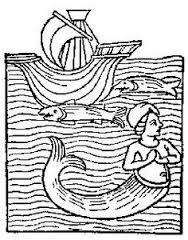 ONE WAS BASED ON THE LAND, AND THE OTHER IN THE SEA. THE PEOPLE OF THE SEA DID NOT MIX WITH THE PEOPLE OF THE LAND, FOR THIS WAS THE WAY THEY WANTED IT. THE GROUPS WERE NOT TO INTERMINGLE OR INTERMARRY, AND THE PENALTY FOR SO DOING WAS DEATH, THE GUILTY PARTY TO BE EXECUTED BY THE CIVILISATION OF WHICH HE WAS NOT A MEMBER. MY STORY CONCERNS A YOUNG MARINER, WHO SAILED ON HIS SHIP PAST A TINY ISLAND IN THE OCEAN. HEARING THE MOST BEAUTIFUL SINGING, HE SLIPPED OVERBOARD AND SWAM TO SHORE. THERE HE MET THE MERMAID OWNER OF THE BEAUTIFUL VOICE, AND SHE WAS EVEN MORE LOVELY TO BEHOLD. HE WAS BEYOND HELP, FOR HE WAS IMMEDIATELY ENAMOURED OF HER, AND SHE OF HIM. EVERY DAY, WHEN HIS SHIP PASSED THE ISLAND, HE WOULD SWIM ASHORE TO MEET HER, AND THEY WOULD EMBRACE ON THE SAND AND MAKE BEAUTIFUL MUSIC TOGETHER. HOWEVER, AFTER THIS HAD BEEN GOING ON FOR SOME TIME, HE NOTICED THAT HIS APPEARANCE WAS UNDERGOING CERTAIN CHANGES. THE COLOUR OF HIS SKIN HAD CHANGED SUBTLY, TAKING ON A FAINTLY COPPERY GREEN TINGE. THE TEXTURE OF HIS SKIN TOO, WAS EVER SO SLIGHTLY SCALY, AND THE HAIR BELOW HIS NAVEL GREW LONG AND LANK LIKE SEAWEED. THIS HE CUT OFF WITH SCISSORS WHEN NO-ONE WAS AROUND, AND HE HID THE CLIPPINGS UNDER HIS SACKING BED. NOW THE BED WAS A MATTRESS ENCLOSED IN A RECTANGLE OF WOOD NAILED TO THE DECK, AND WHEN TWO OF HIS FRIENDS WERE HORSING AROUND, WRESTLING, THEY DISLODGED HIS MATTRESS, EXPOSING THE CLIPPINGS FOR ALL TO SEE. ALTHOUGH NO-ONE REPORTED HIM, IT WAS IMMEDIATELY CLEAR TO ALL WHAT HIS AFTERNOON ABSENCES MEANT, AND THE WORD SOON GOT OUT, REACHING THE EAR OF THE KING OF THE SEA. HE SENT MESSENGERS UP FROM THE DEPTHS, AND THEY SEIZED HIM BY HIS HAIRY GROWTH, DRAGGING HIM DOWN INTO THE WATERS TO DROWN. AND THE KING OF THE SEA, FOR HIS PART, NOTICED THAT HIS OWN DAUGHTER'S SCALES HAD BECOME RATHER WORN AND SHINY IN CERTAIN PARTS, AND HE KNEW THAT SHE WAS THE OTHER GUILTY PARTY. TRUE TO HIS TREATY, THE KING HANDED HER OVER TO THE PEOPLE OF THE LAND FOR EXECUTION. SHE WAS GUILLOTINED, AND CHOPPED IN LITTLE PIECES AND FED TO THE DOCKYARD CATS……………. (long pause). AND TO THIS VERY DAY, DO YOU KNOW, THE FISH NEVER GO NEAR THE SHORE AT LOW TIDE………………… BECAUSE THEY KNOW WHAT THAT GREEN STUFF ON THE ROCKS IS." There were fourteen volumes when I last looked, with more on the way. But we didn’t know that when we agreed to do “Hush Collection, Volume 1”, intended to provide soothing music for children undergoing procedures dealing with leukaemia at the Children’s Hospital. When Dr. Cathy Crock suggested the project, we could see the sense of her idea. She had been looking at ways of improving, and humanising, the stressful process of testing and waiting, testing and waiting. Would background music of a classical genre help? She thought it would, and we agreed. Mind you, Carmina Burana and Ride of the Valkyries seemed a trifle exciting for the task in mind, but our repertoire of inoffensive hausmusik seemed admirably suited. Accordingly, we trimmed our performance from the outset. I would eschew the clarinet and saxophone in favour of the bassoon and the flute, respectively gentlemanly and angelic in character. Margaret would confine her violin to mostly the middle and low registers, and the occasional foray up higher would be counterbalanced by the bassoon and piano. Sue Goessling would offer her solo piano as meditative items, and together we chose light, bright and positive items in a mixture of keys. The dynamic palette was also reduced so that volume was relatively constant. Thus agreed, we entered the South Melbourne Town Hall, famous for its “bathroom acoustic”. Bathroom acoustics are excellent, of course – in bathrooms. The thrill of hearing one’s sound ring on has fired many an excellent performance. But we were not so sure of the sound that rang on – and on – and on. Jonathon Rowland, recording the session, was excited by the challenge of the space, and decided that, unlike just about all professional recordings, we would not insert any echo at all (most recordings are made in an extremely dry acoustic, with echo added later). We were limited for time, and on a very warm – no, hot -- early Summer evening, we set to work. Of course, it takes a while to set up microphones, and to get the right balance before you can even begin to think of playing and recording your 22 tracks. Flute and bassoon require highly different recording setups, but that was eventually resolved. So too, was the piano, and just where piano mikes go is always a moot point. So we practised a little, not looking at Jonathon, and when we opened our eyes, found that the mikes, like Baba Yaga’s hut, had moved yet again in the interim. Meanwhile, Adelaide had gone off to the Botanic Gardens to be filmed dancing in what might have been promotional material for the CD. It was to be footage of “The Swan” to be shown with that very music, with a bit of luck. We were ready to roll, but the sound of the air-conditioning was horrendous. No recording made in that hall, with that noise, was going to sell. Unfortunately, Mr. Air-conditioner man had gone home, taking his keys with him, and he lived many miles away, leaving no contact details. The first steps were taken to start finding him. We practised some more, and adjusted some more microphones. Unfortunately, it was hard for us to know what we sounded like, for Jonathan didn’t have any “fold-back” with him. This is usually a studio speaker, where you can play back your most recent effort for preliminary assessment. We were able to share a set of headphones, and of course this proved time-consuming and tedious. Fortunately this took up much of the time until Mr AC returned with the keys. These he surrendered to us, with instructions for their use. The light was dimming now, but at least it was quiet. It was getting urgent, so we tore into it. We got a few down straight away, generally just 2 takes and a bit of a scrappy listen, fighting each other for the earphones. In the middle of one the Town Hall bells chimed. We were tempted to leave it in for charm, but on reflection we thought it might frighten the children. It was more the bell of Quasimodo than Tinker Bell. Start again, and make sure, in future, to stop before the hour. By now, although it was generally quiet, the temperature had risen inexorably. I could feel my shirt sticking to me, and was finding it hard to retain my grip on the flute. C#s were becoming dangerous. The temperature and the pressure were both mounting. At this stage, Adelaide returned from the gardens, and you could tell it was much hotter out there than it was in the hall. We needed to record us playing, and her dancing, The Swan, again, to mix and match with footage already taken. So we played The Swan several times, very well, as Adelaide danced over chairs and music stands, just like a real swan (well, perhaps not). This was costing us time, and outside, we could tell that the rush hour traffic had long subsided. An occasional hoonish motorcycle, the odd early Summer scream or two and some determined crickets were all that stood between us and our objectives. The evening settled into a long blur of music, mikes and endless coffees. Was it around midnight we called a halt, turned the aircon back on and were mocked by the bells? I’d like to say we slept well, but the long and short of it was that after another busy day, we arrived at the Town Hall. Wait till the bells have struck! Of course, due to our professionalism and talent, the finished product is a relaxed, soothing and tuneful showcase which has pulled many a family through a rough day. It is a paradox that the music does indeed exert a powerfully soothing effect even while you are playing it. You can’t really alter the plan of these little gems by Mozart, Bach and friends. They unfold at their own pace, with their own logic. And herein lies their timeless appeal. Of course, there is a certain amount of editing before putting the final version out. Again, having to return to our other tasks, it was difficult to find enough time to pick the best runs, and the cutting room floor may hold certain passages which had been destined for greatness. Nevertheless, we were pleased to finally have it out there, and to get the project started. As it turned out, there was so much material on the CD we had to leave some off. And it was not possible to put any of Adelaide’s beautiful Swan work on a mixed media CD. But moving house recently, we discovered some archival tape from the first day. So, thirteen years later, here are some pictures. “My Mother used to say 'Never trust a man who wears a bow tie during the day'. So said my friend to me. 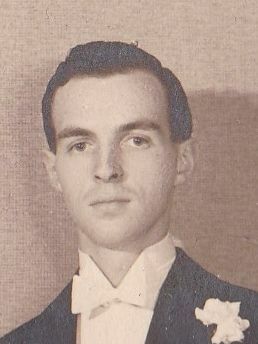 I was dressed in a bow tie at the time (and sundry other garments of course). It seemed to be an invitation to search my soul. Bow ties are concert gear of course – generally, evening wear. Famous bow tie wearers like Abraham Licoln and Sean Connery (as James Bond) seemed above reproach in the trustworthy stakes and were, presumably, night-time wearers. That seemed to leave me with Pee Wee Herman. But in my own defence, I have to tell you the story. Not long out of the army, and with only a year's bassoon experience, I joined the National Training Orchestra in Sydney. About thirty of us rehearsed nine to three daily in a pleasant hall in suburban Lindfield. I struggled to lift my standard to that of those around me, and in particular, to make a good impression on Margaret Dickson, the new arrival from Melbourne, never dreaming that we would one day be married. Margaret was appointed to lead the orchestra in a concert performance of Pulcinella, by Stravinsky, and played with polish and elan to match her beauty. During the concert I, however, became mildly distressed as things went wrong. First, a muffled note, then a wrong one, even though I seemed to be playing the right notes. 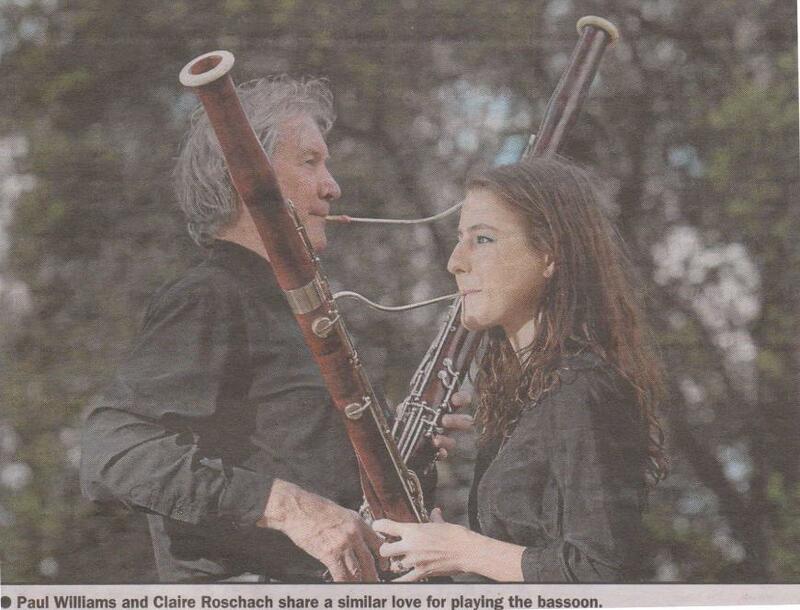 I blew water out of the instrument, tapped rusty keys and adjusted the elastic bands which served as springs on my clapped-out old Kohlert bassoon, borrowed from the Conservatorium of Sydney. Still the disasters continued, and my confidence plummetted. What would Margaret think of me? It was during the fifth movement that the light dawned. As I turned the instrument over to check the back, I nearly choked. My tie was caught, as it had been all concert, under the C sharp key, causing all sorts of problems. I had practised everything but wearing a tie while playing the bassoon. Yes, you guessed it! The next concerts saw me in bow tie, day time or night time, and if anything was ever less than perfect, one had to look for other reasons. And what had Margaret thought at the time? She was too busy with her own solos and never noticed a thing. I have destroyed all copies of that concert, for artistic reasons of course, and continue, on occasion, to wear my bow tie in the daylight. It is Sunday morning, and I am sitting in the classroom, at my desk, where we do our supervised letter-writing. 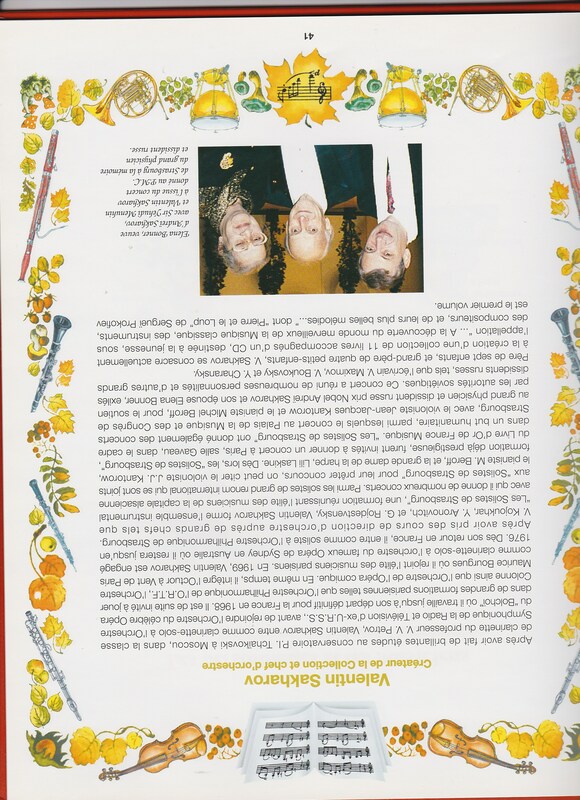 I have finished my letter to Mum and Dad, with its recall of the week's activity – the sport triumphs, the academic news and the religious feasts celebrated with picnics and ritual. I am re-reading Mum's last letter, in which she expresses concern for her father, who lives with us. She warns me that Grand-dad is not likely to make it through the Winter. This of course, means that he may die anytime, and his soul will be judged. There are only two options – Heaven or Hell. I try to imagine Grand-dad in Heaven and I can't manage it. He doesn't seem to have the right outlook. He is a man who takes himself seriously and has strong opinions which he loves to share. I have never seen a trace of religious sentiment from him, and although of Irish extraction and nominally Catholic, is a well-known "priest-hater". If he has ever been to Confession, to free himself of sin, it must have been over forty years ago. I have to face it – he seems destined for Hell! And how can I enjoy Eternity in Heaven in the knowledge that my own Grandfather is enduring eternal punishment in hell? If only he would go to Confession! Should I, his fifteen year-old grandson, encourage him to confess? What effrontery! But balanced against the awful alternative, what choice? So I manfully took out my pen and wrote "Dear Grand-dad, well, I suppose you have had a pretty good innings, which you would be pleased about. But, like all good innings, it must come to an end some day, and then you will go to heaven no doubt. I am sorry for all those people who don't have the chance to go to Mass and Confession so their souls are ready for death, which comes as we are told "like a thief in the night"…and "we know not the hour". I know you haven't been to confession for a while but I hope you will be going soon so we will all be together in Heaven one day. I was thinking of you when we were listening to the Opera in a class yesterday. It was Sicilian Vespers and I wondered if it was one of the operas you used to see…(etc.) Your Loving Grandson Paul." Grand-dad survived the Winter and died the next year. He spent many night sitting up in his chair afraid to sleep lest he never woke. When he did die, it was in terror and it proved impossible to compose his face after death. A veteran of the First World War, he died of breathing complication brought on by Mustard gassing in the trenches. Although he enjoyed a party, he had a mordant view of humanity and by way of explanation would only say "I know men". He returned from the trenches in the Somme, only to return to the action in a few months' time. He wrote many letters for fellow soldiers who could not write and claimed that he was thereby responsible for some successful unions. How strange that Adelaide, almost a century later, while dancing at the Moulin Rouge in Paris, should tell us that she had been approached by two of her Australian colleagues to help them write letters home. When clearing up her parents' effects, my mother found letters to her mother, in beautiful and poetic language. She was most embarrassed to find this correspondence from her mother's lover – until she realized it was from her father. She certainly never heard him use this language in life. When I told my mother of the message from the tall man ("please tell everyone that I love them though I could never bring myself to say so") when I visited the Scottish lady seer, she simply said "It's Dad". Grand-dad never spoke of the War until the very end. He spoke on three successive evenings to my Aunt. On the first evening, she was horrified to see the change come over his face as he spoke. She said that his face simply became the Mask of Tragedy. On the second night he was more composed, but on the third night, as he described the mud, it happened again, and he asked my Aunt to leave off the questioning, as the nightmares were starting up again. He said that they agreed never to "tell the women" just what it was like and if you wanted to know more, just read "All Quiet On the Western Front". Grand-dad was very sick, and was mostly bed-ridden with an oxygen tank by the bed. Occasionally he would get his pills mixed up or have a bad reaction, so that my mother found him running naked around the back-yard on a freezing June morning thinking he was on a spree with Yuri Gagarin. As the years passed, the thought of my letter to Grand-dad caused me some embarrassment until finally, after forty years or so, I asked my mother "Mum, did Grand-dad ever get a letter from me at boarding-school?" "Oh Yes, he certainly did". "Oh-what did he think". "He thought it was just tremendous…he had a great laugh, and whenever anyone called in or came to visit, he would say 'Come and see the letter my grandson wrote me'". I had shared a room briefly with Grand-dad and my two brothers some years earlier. My parents had taken them in to care for them, and the flat at the back was not quite finished. My brothers slept, but I listened with gritted teeth as Grand-dad struggled to draw breath, finally achieving a lungful in four or five laborious steps, only to exhale with a groan, and re-start the process. He would tell us stories of his travels, and generally they were the sights and sounds of the journey, though, as I have mentioned, he never spoke about war. In Colombo, he said, "I went for a rickshaw ride. They are carts pulled by coolies. Well, there I was, with the chap off at a jog, and I looked up and saw Tommy in the cart next to me. A race! I thought. Giddyap, I shouted, and you know, that chap stopped in his tracks, laid down the traces, and said to me 'Master, I am only a man and not a horse'. Well, I can tell you, I felt about as big as threepence." "In Africa, we stopped by a river to wash our clothes. Any chance we got, we would wash to get rid of the lice. Suddenly, around the bend of the river came these enormous war canoes, loaded with savages, magnificent fighting men. And now we're arming them to the teeth with modern weapons – it can only be a disaster." And Grand-dad would often say "Mark my words, the Hun will rise again. We should have dropped a bomb on every German city while we had the chance." So, on reflection, Grand-dad was probably a man of his time. It is strange to think that he was born in the Colony of Victoria in 1888. There is some truth in all of this. Blowing either instrument need not be difficult – if you can blow most of your birthday candles out, you’re on your way. My own preference for young players is indeed to start on the clarinet. The tone is more refined, and it is necessary to exercise greater discipline over the fingers, as they must seal every hole which they cover, otherwise permitting squeaking. The saxophone holes are closed by pressing buttons, which are far more forgiving. This often allows careless placement of the fingers, which hampers advanced development. A teacher will monitor this of course, but will always be aware of the huge variation in finger sizes and shapes. Naturally, to many, the appeal of the saxophone compared to the clarinet is like the appeal of the guitar compared to the violin – the saxophone is simply funkier, while the clarinet is capable of the most beautiful abstracted expression. For young players, the technique of the saxophone is actually simpler, and playing it is more straightforward and less complicated. In reality, if an instrument does not “speak to you” there will be little point in trying to play it, but it has been my experience that those who have worked on both have appreciated it. I have also had brilliant saxophone pupils who have never touched, and have never missed, a clarinet. In presenting a “comparative woodwind” session for the VMTA's Summer Conference, I confined myself to the flute, recorder, oboe, bassoon, clarinet and saxophone. Mindful that the audience would range from highly knowledgeable to blissfully ignorant, I tried to cover the main bases with material ranging from banal to insightful. “Familiarity breeds contempt” we are told. This is not a happy outlook for the much-maligned recorder, the best-known of the woodwinds. St. Paul said “When I was a child, I spoke as a child and thought as a child, but now I am become a man I have put away the things of a child.” This is advice which all too many promising young recorder players have acted upon when beginning High School. The ubiquitous and overworked recorder has borne the stigma of “primary school tool” for too long. In reality it is a highly expressive instrument capable of virtuosic display. It does however, present certain challenges. Its very simplicity makes it highly effective in simpler keys, but renders chromatic passages extremely difficult, hence its fine record in music of the sixteenth to eighteenth centuries. Modern composers have produced much engaging and challenging literature for the recorder in both solo and ensemble form, and virtuosi like our own Genevieve Lacy provide fine models across all forms. It will hardly come as a surprise that the most effective recorder groups are those which are led by dedicated and well-supported individuals, either in studios or schools. Intra-group peer support seems to be an important factor in actively establishing respect for the instrument and its repertoire. And since nothing grows from nothing, the fine work of many hundreds of recorder groups across the country must be acknowledged. The teachers who run these groups have been responsible for seeding many careers, mostly on other instruments. In many cases these teachers are the thin red line between culture and the forces of materialism. I would love to see the work of these teachers carried on to higher levels by their talented graduates. The flute, which we also know well in its metal form, developed from the recorder, and features an array of keys. The early flute looked rather like a recorder but was held sideways. The sound was produced by blowing across the mouth-hole, splitting the air stream. The recorder channels the airstream down a tunnel, and the stream splits against a fipple (or little ledge) which is fixed in place. The angle of the air stream on the fipple is fixed – you can't change it. On a flute, you can change this angle, giving the player more control. When the English player, Nicholson, produced a bigger sound than his continental counterparts, they were very annoyed. They found that his flute had large finger holes, producing a bigger sound – he had enormous hands. Boehm, the German flautist, produced an instrument with large holes, but closed them by an ingenious system of levers and springs, which is the modern flute, capable of three octaves at dazzling speeds. The primitive flute of Mozart's time (he didn't dislike the flute, just abhorred the poor intonation so frequently encountered on it) was soon superseded by the instrument we know today. The lowest register is problematic for the young player, as the tone is naturally weak. This is not an insuperable problem, but needs consistent and dedicated work. The commonest complaint for a beginner is dizziness. This is merely oxygen surfeit from frequent blowing attempts, and passes quickly. The next problem is the inability to produce a sound. If the player can produce an airstream of the right velocity and focus, the flute (or just the head for starters) can be brought into line with the stream, thereby starting the tone. It then becomes a “knack”. Some have it right away, and others take a considerable time achieving it, but ultimately may do just as well. Flutes have no reeds, and few moving parts to service. Maintenance is generally inexpensive, and the instrument itself not hard to acquire. Flute groups are fun and are found in most schools. Tuning adjustment is done firstly, by pulling the head joint out a little (this makes the instrument longer, and therefore flatter), or conversely, pushing it further in to make it sharper (often necessary in Winter). This is only an approximate tuning, and the player gradually learns to adjust for more refined tuning, by turning the head joint outwards (sharper) or inwards (flatter). These adjustments are necessary to counteract the tendency of the flute to play sharper in “f” and flatter in “p” dynamics. One problem for the young flautist is the difficulty of finding solo spots on such a popular instrument. One solution for some has been to play the oboe. It looks rather like the clarinet, being small and black. However, it is a reed instrument, the reed being a double-bladed piece of cane (really “Arunda Donax” the Mediterranean giant grass from southern France). Whereas the flute player communes with their muse in a natural singing style, the oboe player must come to grips with the reed, which provides considerable resistance. Sitting behind orchestral oboists, one is in no doubt of the back pressure involved, which results in bulging collars and eyes. As you would expect, this is not completely necessary, and there are many players who play beautifully with minimal resistance. This said, it must be acknowledged that the oboe is a very physical instrument. Early efforts at the oboe can be hard to live with, but modest gains become very effective. “A little oboe goes a long way” would seem to be the maxim of many a composer. Pick up the woodwind books of major Symphonies, operas and ballets, and you will find thick volumes for the clarinet, flute and even the bassoon, but the oboe volume is a slim one. The oboe has two and a half octaves compared to the flute's three and the clarinet and bassoon's three and a half. Good composers realise that the instrument must be used sparingly, for both aesthetic and practical purposes. However, the oboe has a disproportionate number of highly expressive solos to play, making it a satisfying and rewarding instrument. As with the all woodwinds, a good ear is necessary to make the final adjustments in tuning, mainly through altering lip pressure. The student oboe is usually at least twice the price of the flute, reeds can be expensive, and a specialist teacher is advisable, particularly with reed selection and adjustment. The oboe's close relative is the bassoon, the tall chimney-like instrument lurking in the orchestra. Most non-musicians, upon being shown a picture of a bassoon, will identify it as the oboe, the sound of which word reminds them of the tone of the bassoon. This is an understandable mistake, based of course, in ignorance. If you would correct them most bassoonists will be deeply in your debt. The heyday of the bassoon is long gone. Vivaldi wrote 50 concerti for it, Mozart 4 and Weber 1. Yet in that period the expressive powers of the orchestral bassoon increased enormously. The bassoon is a creature of half-moods. In its native register one would use the cello for lushness of tone. With the bassoon one gets dignity. For power the trombone is unrivalled. The bassoon offers earnestness. The French Horn gives grandeur, while the bassoon offers quirkiness. The bass clarinet, snarling, suggest evil, but the bassoon can only manage cantankerousness. You will hear the bassoon as an unrivalled spare-parts instrument, colouring a cello solo, offering a woody octave sound to the clarinets, being, for all practical purposes, a fifth horn here, and a third trombone there. In chamber groups too, the bassoon is popular and useful. The bassoonist is never short of colleagues, all of whom want that warm, solid bass to underpin their efforts. The reed is larger and more forgiving than the oboe, and the amount of back pressure is quite a satisfying one. Expense may be a problem, as most school bassoons could cost as much as two flutes, two clarinets and an oboe all put together (or, roughly, six flutes, or five clarinets or three oboes or dozens of recorders). All the instruments so far mentioned are in concert pitch. That means that they can play piano music unaltered. Now the picture changes. May I introduce – the clarinet! Like the flute and the oboe, pressing down the first second and third fingers of the left (upper) hand, gives us three descending tones. On the flute and oboe and recorder, these are B A and G. On the clarinet, these are called E D and C. However they sound D C and Bb, a tone lower than their names. Consequently, clarinet music must be specially written a tone higher to compensate. There are many instruments like this, and their pitch is named after their named note C. The alto saxophone, playing a written C, sounds Eb a sixth below. It is, in consequence, the Alto Sax in Eb. Other instruments like this are the French Horn, Trumpet, Cor Anglais and Alto flute, just to name a few. It's an historical accident that they have turned out like this. For example, the C Melody saxophone was popular in the 1920s, but eventually it proved to have neither the mellifluousness of the alto or the virility of the tenor saxophones, so was abandoned. Like the flute, the clarinet is an extremely nimble instrument, featuring the same Boehm system of keys levers and springs used on the flute. However, there is an anomaly in the clarinet sound as it comes out considerably deeper than one would expect for an instrument of this size. This is because it acts as a stopped pipe, the vibrating column of air being a U-shaped one, twice the length of the instrument. This gives a pleasant woody, hollow sound n the bottom register which is easy to learn and admits of fast progress. However, on the left thumb is a special key, known on the other instruments as an “octave key”. Press this and tighten the embouchure, and suddenly, you're singing soprano. Try this on clarinet and you are in for a shock-the note jumps not eight notes, but twelve. In the upper register one has to re-learn the clarinet. The home sequence of notes in the bottom register is F Major, like a treble recorder, but in the upper register it is C major, like a descant recorder. Since the clarinet is an instrument of the mid-eighteenth century, it has little baroque or early music, but much has been adapted, with varying degrees of success. It was a highly popular instrument in the 30s and 40s in the hands of the swing masters, but has largely been overshadowed in jazz by its glamorous cousin, the saxophone. The saxophone was invented in the 1840s and has prospered. It looks like a highly complicated instrument, but in reality all that metal key-work enables a simple technique over two and a half octaves. The precision demanded of a clarinet player's fingers in sealing the finger holes is considerably relaxed on saxophone, the pearl buttons being quite forgiving of less-than-perfect finger placement. Saxophone tone is powerful and manipulable, enabling fast progress, but also allowing great freedom of expression in the right hands. The low notes are hard to produce unless the instrument is maintained in top condition – rarely the case in hard-worked school instruments. The alto is the best known, and is in Eb, while the larger tenor is in Bb, an octave below the alto. The baritone is rarely privately owned, because of expense, but is an essential part of the stage band saxophone section, and provides a rich bass for the sax section. 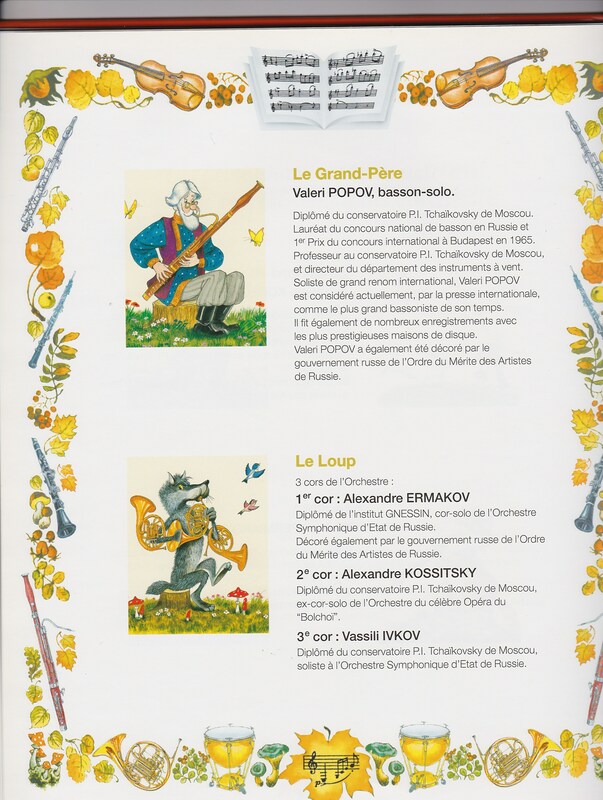 There is much literature, in both “classical” and contemporary styles, to engage and entertain the young saxophonist. As a family, the woodwinds are highly individualistic and colourful. They are worth getting to know even if occasionally temperamental, and will provide a rewarding relationship. Eric was excited when he mentioned his violin to us. He'd found it in a little antique shop, and it didn't look like much, he said. Could he bring it over for Margaret to check? Well. Of course, but we didn't hold our breath. We'd seen them before, and the clearly visible “Antonio Stradivarius, Cremonensis 1722” was all too pat. But then again, they do happen, and one would feel a chump if a rough diamond were to slip through one's grasp. After all, we knew of a teacher who provided his student with an expensive (over-priced actually) instrument, only to feel guilty a couple of years later. In this repentant mood he offered the young man a choice of various instruments of humble provenance. Taking one of these instruments because he liked the sound of it, the student then had it refurbished and re-valued, and was delighted to find that its value had increased ten-fold. The teacher felt a little sick. Eric's violin, sans case, certainly looked “pre-loved” and had evidence of extensive and rather rough repair work. Nevertheless, there is every chance that it could still be a worthwhile instrument, probably what is known as a “German trade instrument”, or an instrument made in Germany probably 100 years ago, on the lines of a Strad. There are many of these around and are respected by professionals if they are any good. But refurbishment would be expensive and probably raise the value to less than $1000 (at most) if the instrument is viable at all. On the other hand, if it turned out to be the genuine article, Eric would soon be buying a rather nice beach house (or taking violin lessons). Let's take the clarinet for example. All instruments seem to come with their share of arcane knowledge, and the clarinet is no exception. What a little miracle it is to see a teacher make a few adjustments which transform a shrieking monster (the clarinet, not the child) into a smooth and mellifluous sounding object, with limitless potential for musical expression. Of course you should be at the first (and possibly a few more) lesson. Lining up the joints is important, so that the finger holes on the two main joints are lined up. In joining the two main sections, it is also important to have the overlapping, projecting plate at the bottom of the smaller joint fit neatly over the corresponding receiving plate on the larger joint. The reed should be moistened (washing) and its flat surface pressed for some seconds against another flat surface (ironing). A dry reed is unresponsive and squeaky (you've noticed?). CLAMP The reed is held against the opening in the mouthpiece by a clamp called a ligature (from the Latin “ligo” – “I tie”) usually metal, but not always. Traditional German clarinettists wrap the reed on with special string. This should be done up firmly, but not tightly. (pron. ombeshure, meaning the mouth grip) The top teeth rest on the mouthpiece's upper slope about half-way. The bottom lip curls over the lower teeth, which then bite upwards, pressing the lip against the reed. This provides variable control of pitch (tuning) and tone (sound quality). The left hand goes on top, and the right hand on the bottom The right thumb has a special support. This thumb can feel the strain at times, and there is a special device for young players. It is a sling (like the saxophone one) but just a little different. It is an elasticized velcro loop which just takes the weight off the right thumb, and is a great idea. Fingers are amazingly different. As is the case for most instruments, the fingers should be curved, with the pads of the fingers covering the holes firmly. This is not always as simple as it sounds, and it is wise to work from 1-finger notes to those involving successive fingers. Hasten slowly here, concentrating on long notes and beautiful sound. Any leakage of air through inaccurate finger placement will result in the unfortunate squeak. Fingers live close to the holes they cover, and any excessive movement is not conducive to good technique or expression. Generally one plays the hardest reed one can manage with comfort. Reeds are numbered according to the thinness of the tip. A soft, thin reed is #1, while the hardest grade is #5. I have never used more than a three and a half, and mostly use two and a half and three. “No puffum cheekum” my Indian mentor would tell me. The Dizzy Gillespie look (see him on YouTube) is frowned upon, and the cheeks should be firmly held in using the dimple smile we reserve for photos. It's good exercise for the face muscles, and will keep you looking young forever. Diaphragm breathing is essential. Basically, just think of it as breathing through the stomach. It's like having your soup – as your parents told you, you don't go to the soup, the soup comes to you. Similarly, on clarinet, the head should be upright and straight, not forward or to the side. This is important for one's health. The instrument is then lifted into position, providing the best basis for tone production and a pleasing look and style. This is very useful, for often the player sees immediately what others may have noticed, and is keen to remedy the problem without being chided. Practice sessions should be short at first, but should number at least 5 a week. As stamina and technique build, sessions may become longer, which will not be tedious because of the more interesting repertoire being essayed. In our “connected” age, many children find it hard to work alone, so any company you can provide is good, any sense of sharing is valuable, particularly if you can simply relax and encourage, especially in the early stages. Later on you may be evicted from lessons and practice. That can be a sign of progress. Enjoy! !